Let’s talk strategy. How can you leverage Google social ads to be most effective and take advantage of the social extension your company has added? Adding +1 buttons and letting people see their friends in the ad campaigns you create is a strong start. All these tools should be in your overall campaign strategy. Read on to find out how you can maximize the benefits. The first step to building a good strategy for your Google social ads is to think about engagement. How are you going to engage those who see your ads, and how are you going to entice them to end up at your website? What is your purpose? Do you want more fans of your Google+ Page? Or maybe you just want a person to refer more friends to your brand. Figure out the answers to those questions, and they can help you figure out how to build your ad. Use your ad to tell your viewers what you want them to do. As with a typical post on Google+, be sure you use a call to action to tell your viewers what you want them to do with your ad. If you want them to click it and buy something, try to get that message through. Use text that calls for a positive response. For display ads, find images and videos that reflect similar messaging. You’ll be surprised to find that your audience doesn’t necessarily know what you want them to do when they see your ad. Sometimes, just a little nudge can push them in the right direction. Recognize that your fans are now seeing your Google+ Page with your ad. Because your ad has a +1 button attached to it by default, and you know you benefit by having people click that +1 button, entice those who see the ad to click the button. +1 buttons. They increase the +1s for your Google+ Page and website — and the additional endorsements make your ad even more interesting. Recognize that your fans are now seeing their friends with your ad. As with the +1 button, if a person’s friends have clicked +1 on a particular Google+ Page that’s associated with your ad, their names or profile images will show up with that ad. Maybe some text along the lines of “See, your friends want you to click” could help your campaign. Integrate a Google+ login button. Point your developer to Google+ to find out how to integrate a Sign In with Google+ login button that authorizes the user and gets the information you need to start building a social experience. When a user is authorized, you can pull information from his or her Google+ profile and start to find things such as people circled and posts made, provided the user has given you permission to do so. You can also automatically start publishing to a pre-established queue (named History) that users can select to publish to their circles. Find the logged-in person’s friends, and determine which of them have +1’d or circled your page. After the users are logged in, you can continue the experience they just saw in the ad by detecting who they’ve circled; you do so by making calls with the developer API, or Application Programming Interface. Then go through the people who have circled or +1’d your Google+ Page and determine whether any of the people they circled have also interacted with your Google+ Page. As soon as you know who has circled whom, you can start to build social experiences out of that information. Entice those folks to +1 or circle your page through a Google+ Page Badge as a way to join their friends who have done so. Help them feel that they are not alone in the process of purchase or of conversion from visitor to customer. Determine which of those friends purchased your products, or converted to a sale or within your business goals. Among your authenticated visitors’ friends, look to see who has purchased products or has completed the conversion process. Use that list to entice users to do the same. Show a list of their friends who have purchased products. Or show the products purchased by their friends. Maybe you don’t show which friends purchased which products, but just let them know that some of their friends purchased a particular product. Seeing their friends’ names and images in Google social ads makes them want to follow suit. You can encourage them to click a +1 button or Share button. 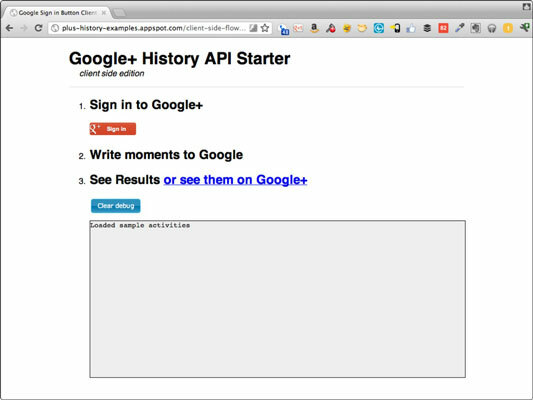 You can automatically push items to a special queue called History that Google has set up. History is not yet available to the general public, so you may not see it. However, developers can start testing it. Depending on its state, your visitors can choose which items they want to share with their circles.